Art projects, tea parties, and snack time are all the more fun with the Baby Relax Hunter 3-PC Kiddy Table & Chair Set. Stylishly simple, this set includes a kid-friendly height table and two chairs. 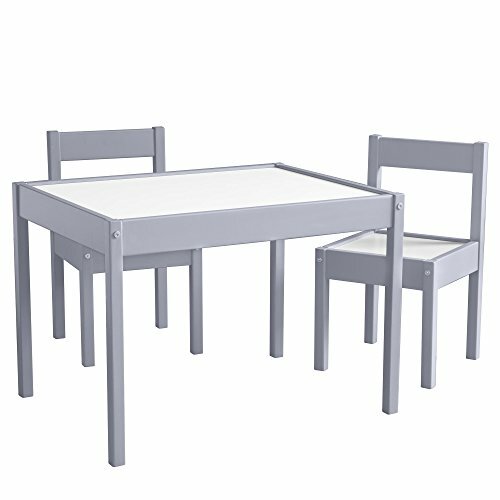 Featuring a sturdy wood construction, your kids will love the look of the gray frame and white table and chair tops. To make life easier, the table top is designed with a low border that will help keep puzzle pieces, crayons, and small toys on the table and off the floor! The ideal solution for kids' playrooms, nursery rooms or even in the living room, the Baby Relax Hunter 3-PC Kiddy Table & Chair Set will have everyone wanting to sit at the kid's table.